I'll find some peace tonight." Generally speaking, I will give pretty much any type of music a try regardless of my dislike for any particular genre or artist. That said, I am very close-guarded with my favorites, as my central core of a half dozen bands and artists rarely leave the CD changer in my vehicle. Alongside the likes of Coldplay, Dave Matthews, and Incubus rests the sweet and gentle voice of Sarah McLachlan, the Canadian chanteuse whose melodic songs and powerful lyrics never grow old with time. And time is something that McLachlan fans have grown accustom to. Recently, she returned to the charts with her most recent CD, Afterglow, after a four year absence in which she took time to raise a family, which returned her triumphantly to the number two position, and released one of her most assured singles in Fallen. To continue the recent trend comes Sarah McLachlan: VH1 Storytellers, a forty-minute concert recorded shortly after the release of her hit album, Surfacing. For those not familiar with the format of Storytellers, it is rather ingenious. A popular artist (the likes of Billy Joel, Dave Matthews, Tori Amos, and others) sits down and plays their hits while breaking between performances to answer questions and explain the concept behind a certain song and the personal meaning behind it. In Mclachlan's case, she brings both her winning personality and her collection of terrific music to the stage and the result is certainly one of the better episodes of the now defunct show. McLachlan performs a range of songs and offers insight on nearly all, the most poignant being Angel, a song that is revealed to have been about the death of Smashing Pumpkins keyboardist Jonathan Melvoid and the toll that being on the road takes on an artist. Other insights include how the film Leaving Las Vegas inspired the up-tempo single, Sweet Surrender, and Sarah being joined by fellow Lilith Fair artist Paula Cole for the song Hold On. Technically the concert is very well done; the camera work and set design are top notch. The set has a very welcome feel to it as lush amber tones are present throughout and McLachlan's surroundings make the viewer feel very much at home. Image Transfer Review: The performance is presented in a full-frame aspect ratio that is very strong throughout. There's very good sharpnessto the image, particularly in the closeups of McLachlan in which her hair and jewelry are very detailed. Colors are done nicely with the lush browns and tans coming off quite well. This is a very fine transfer. Audio Transfer Review: Sound is presented in both Dolby Digital 5.1 and DTS mixes and both do a terrific job of bringing the experience of seeing McLachlan live to your home theater. The most impressive aspect of the mix is that for once it is nice to see all of the music pushed towards the front speakers, while crowd noise and other ambient effects are relegated to the rear speakers. This helps in keeping with the concert atmosphere, rather than some mixes where the music comes from every speaker, lessening that feeling. The DTS mix gets the upperhand here as it features improved clarity and a much more solid presence in the .1 LFE channel. Extras Review: Aside from an option that allows the viewer to view the concert with the songs only and no discussion, this disc is void of any extra features. I am a big fan of Storytellers and I can only hope that Image will continue to release these terrific shows on DVD. 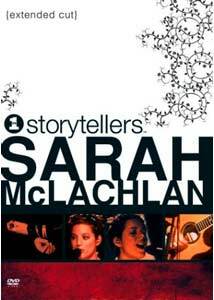 Their most recent in the series, Sarah McLachlan: VH1 Storytellers, is a fine disc aside from the lack of supplemental features. Still, the music is the reason to see the performance and in that department, the disc truly excels.